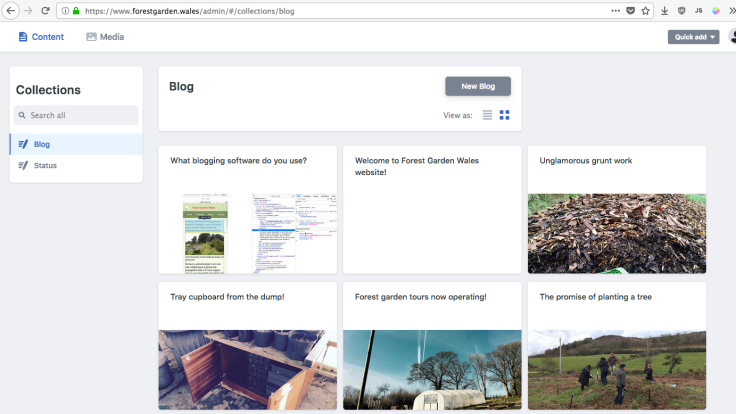 With my web designer/developer hat on, I built the Forest Garden Wales website using an amazing static site generator called Hugo, with my own socially-aware starter theme called Indiego. Static site generators simply(sic) generate static pages without the complexity of a database. The plus points are speed, simplicity and price (for more advantages, see this Netlify article). The downside is that they can be daunting for a non-developer, with lots of editing text and terminals. The good folk at Netlify have made a lovely User Interface called NetlifyCMS that eases the workflow for non-developer people. I would like to see a similar User Interface for the installation process, so that setting up a new website is as easy as WordPress.